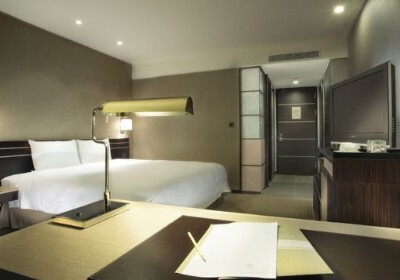 Located on Wenhua Street of Hsinchu City, Taiwan, Sol Hotel is an elegant business hotel with a wonderful location close to major Hsinchu commercial and leisure districts including Hsinchu City God Temple, Hsinchu Science Park (HSP), Dongmen (East Gate) Commercial District and the Hsinchu City Moat (Huchenghe). The hotel also enjoys a convenient location with 40 minutes to the Taoyuan International Airport, 15 minutes to HSR Hsinchu Station and just 5 minutes to the Hsinchu Railway Station. With the geographic advantage in Hsinchu City, you may access to other countries and Taiwan cities conveniently. Airport transportation available upon request. Complimentary access to hotel facilities.